Sysmex is among the most respected and trusted suppliers of clinical testing laboratory services and products in the world. The absolute reliability of their products and the data it collects can save lives. 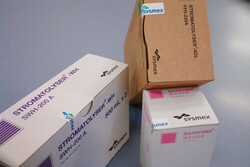 A global leader in clinical blood testing, distributing its analyser and reagent products around the world, Sysmex has an excellent reputation worldwide – a reputation it secures with Diosecure labels from inotec. Reagents are aqueous solvents for the dilution and analysis of blood tests. The bottling and packaging of these products is fulfilled in their state of the art filling plants under laboratory conditions. Fully automatic packaging machinery is used for the packing and labelling of all reagent products. These facilities enable Sysmex to guarantee exact delivery on time, fulfilling customer demands to the strictest quality standards and making Sysmex the leading supplier of all customised haematology-solvents. Every transit package has to be identified and secured within the strict controls of their manufacturing process. To ensure this, Sysmex searched for a label which can offer both the physical security of a seal, but also offer the added data security of an encrypted tamper-evident closure. Diosecure is the next generation in tamper evident security labelling. Both the face and reverse of the label can be printed digitally in colour, with personalised sequential information – even Pictures, Barcodes, QR Codes and serial numbers. When the face is removed, a custom-made imprint is left on the surface to show evidence of tampering and to offer proof of originality. Company specific secure data can be encoded into the printed information, creating further data barriers to fight counterfeiting or forgery. Increased amounts of data and even website links to secure pages, can be encoded using QR codes. In close co-operation with Sysmex inotec developed the perfect solution. The Diosecure labels were designed for use with existing cardboard packaging profiles and specially adapted to ensure that the existing text information was not obscured. Every bag, bottle and carton leaving the manufacturing plant was identified using a unique identity via the new Diosecure labels. Sysmex has now been using Diosecure successfully since the end of last year and they are delighted with the results. The label provides the functionality of a traditional seal, but also offers the complete data integrity and proof of originality that Sysmex and their customers demand. Every recipient of a Sysmex product can be sure that what they receive has been 100 % controlled and secured from the Sysmex factory to them.